It was Mette's phonecall (didn't she call a lot?) that woke us up this Sunday morning. During yesterday's evening out she offered to drive me to my next destination, north of Aalborg, in Vr�. I got a shower and packed my rucksack. After three nights of fun and entertainment in Aalborg, it was about time that I moved again, wasn't it? 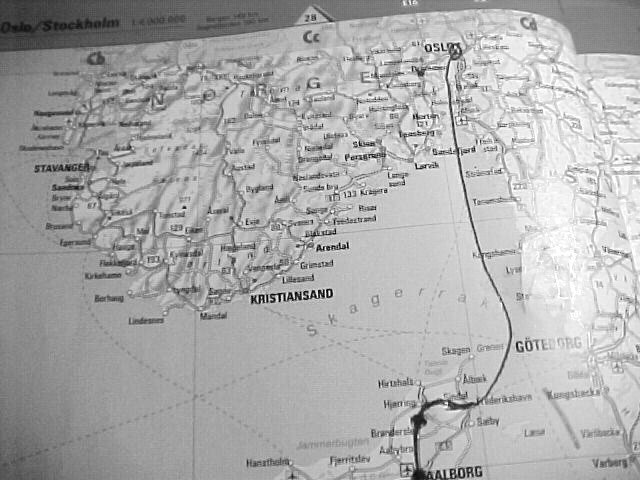 While I had my shower, Lisbet had gone to the trainstation "to see which direction I had to walk to get out of Aalborg," like she had said. But during breakfast she gave me a train ticket to Vr� as a present. "Because it's only two stops away from here." Isn't that sweet of her? It was Mark Mapstone who picked me up in his red Ford Fiesta. I had already figured out that he was an Englishman living in Denmark, originally from Bristol. He met his girlfriend Rikke Steen while he was backpacking in the Indian Himalayas and sudden romance was born. The love for her took him all the way to settle in Vr� where Rikke and he got their son little boy Oliver. I came right on the best day ever to visit Vr� this year. Vr� is a small and peacefull town where the one and only local pub closes its door at 9pm. Today the Social Democratic Party organised a family festival, right in the backgarden of my hosts, as their home belongs to the local high school where Rikke is an alternative dance teacher. The family festival offered pleasures for the young with airblown jumping castles and a lot of political information booths for the older, drinks, food and live music and entertainment by the local clown. And we were all lucky with the sun shining bright above us. At 2 o'clock all people around gathered together as a helicopter had landed nearby and a speech was announced. It was Poul Nyrup Rasmussens, the prime minister of the Danish monarchy, standing right in front of me and starting off his speech. Of course I couldn't understand a word he said, but by Mark's translation it seemed that the big man wasn't that happy with the current economical situation of Denmark. We couldn't really believe this and took a walk to the other end of the festival grounds, to a tent where a band was testing their equipment. Next to me, Mark had three old friends from England staying over, together with two young children. One of them, mother Miriam and Rikke, took the care of the children as the men drunk beers and real English cider on a picnic table. A few beers later we saw the helicopter fly over. The prime minister had left. A handshake on a picture wasn't even possible. The depressed man had absolutely no time. He would have lost a vote if I'd known him better and if I was Danish. When a very old popular Danish hippie performed for an old public, I met up with Rikke again. She was amazed by my means of travelling. She heard about me on P3 Radio and decided to invite me over and help me out in my tour through Danmark. She said that my project was the ultimate way of seeing the world and really meet the people who live on it. When the festival ground was being cleared and the last band was playing some popular rock 'n roll, Mark was preparing Indian chicken curry, the way the English like it. Almost everyone had a little nap of an hour. Me too, as I slept in a bungalow house, just 30 steps ffrom their back garden. There was a line of bungalows and all of them had six seperate rooms with its own bathrooms in it. Staying in a room there, made me think about summer vacation camps when I was young. They were always in a forrest and in a totally unknown place in The Netherlands, in a time where I didn't even know that much about my own country yet. A forrest meant adventure, even if it was only for a week and the school was about the begin again after summer vacation. During my nap I dreamed that I was at my journalism schools introduction camp for the fresh new first year students. A commitee of older students takes them all out to a secret location where they'd have their campsite for three days. Entertainment and adventurous games gives the perfect opportunity to have them all of them meet and get to know each other a bit. Because, of course, the start of a study is also a start of a new era in life exploration. I have some great memories of the times I was a tutor of the freshies, some two years ago. It got eventually very crowded in the kitchen and dinner was terrific! I almost ate two full plates! After dinner the little kids got to bed and we older men sat outside in the garden, drinking coffee, smoking cigarettes and philosophysing about life. [b]Danish grave yards can strangely be seen as the most beautiful parks of Denmark. The community puts so much effort in it, that everything is perfect. Most of the yards are full with flowers everywhere and beautiful cared trees and lots of green. If you thought you'd be walking in a normal nice park, you would have wondered what all those grave stones where doing there. I had seen one when I entered the port of Fredericia, Denmark, earlier this week and I must say that you'd really rest in peace if you get burried in Denmark. Mark loves his job so much. He is, as he said, just obsessed with gardening. So Danish grave yards provide him the best job he'd ever dreamed of. The night was falling in and clouds were starting to spit out rain drops as midnight arrived. 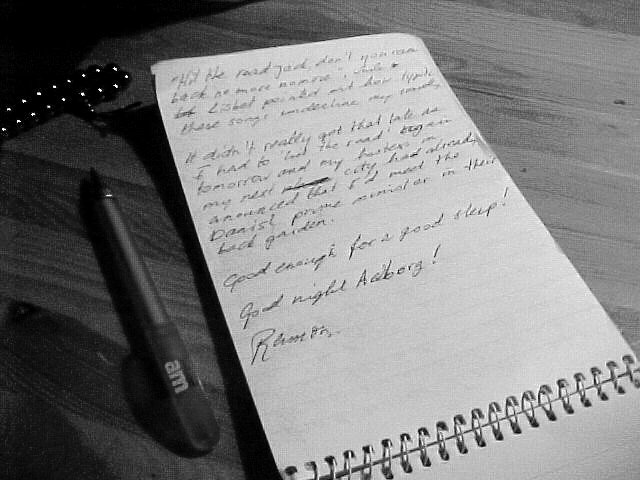 It was bedtime and I took my walk to my own bungalow house again and settled myself in the bed after writing my report in my paper notebook. This would be the last night in Denmark for as far as I can plan things ahead. Tomorrow niht I'd be sleeping on a boat, somewhere in the North Sea.